Chief Logan, Son of Shikellamy, Robert Griffing. "[B]ut for the injuries of one man. Col. Cresap, the last spring, in cold blood, and unprovoked, murdered all the relations of Logan, not sparing even my women and children. There runs not a drop of my blood in the veins of any living creature... Who is there to mourn for Logan?- Not one." Who was this Indian whose words were so powerful that they moved Thomas Jefferson to celebrate them as an example of the power of Native American oratory? In the 1800s, generations of American school children memorized "Logan's Speech," in which an old chief lamented the murder of his family, but surprisingly few learned the story of the man behind those famous words. The life of Chief Logan illustrates in miniature the destructive impact the American Revolution had on Indians and whites. Born into a world created by negotiation and accommodation between whites and Indians, Logan saw that middle ground disappear suddenly after 1774, as violence replaced negotiation on the Pennsylvania frontier. Life and Death, by Robert Griffing, 1997. 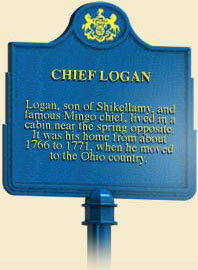 Logan was one of the sons of Shickellamy, the Iroquois headman who lived at Shamokin in the mid-1700s. Logan's English name reflected his father's close association with James Logan, colonial secretary and Indian agent for Pennsylvania in the early eighteenth century. (Historians remain unsure of his Indian name, which may have been some variation of Taghneghdorus.) 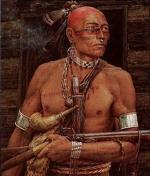 Like his father, Logan learned to play the role of mediator between Indians and colonists. In conferences with Pennsylvania agents in the 1750s, he spoke forcefully about the Indians" willingness to defend the Wyoming Valley against land speculators and settlers. He eventually married a Shawnee woman and moved with other family members to an Indian village on the Ohio River in 1771. 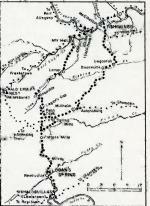 Like many Indians in the early 1770s, Logan probably left the Wyoming Valley in northeastern Pennsylvania to the Ohio Valley following the French and Indian War, and the influx of white settlers into the region. Any respite he found in the Ohio Valley, however, was short-lived. In spring 1774, two parties of marauding Virginians led by Daniel Greathouse and Michael Cresap murdered about two dozen Shawnee, including several members of Logan's family. These unprovoked attacks set off what became known both as Lord Dunmore's War–named after the Virginian governor who used the hostilities as an opportunity to force Indian land cessions south of the Ohio River in modern Kentucky–and as Cresap's War. During this brief but bloody conflict, Logan led war parties to avenge the murder of his family members, attacking settler communities on the Virginia and Pennsylvania frontier. During the American Revolution, Logan led war parties against settlers and squatters along the Ohio frontier. While nominally allied with the British cause, like many other Indians along the Appalachian frontier he was fighting to defend his homelands against any and all interlopers, regardless of their politics. Contemporaries claimed that he died in 1780, supposedly murdered by his nephew. He is most remembered, however, for a speech he delivered to Lord Dunmore by way of Indian captive and interpreter Simon Girty in 1774. Thomas Jefferson was so impressed by the speech when he read it that he included a copy of it in his 1785 book Notes on the State of Virginia, and also charged Michael Cresap with the murders of Logan's family members. Cresap, however, denied involvement in the massacre. In 1797, Maryland Attorney General Luther Martin published letters charging Jefferson with inaccurately portraying the events and falsely accusing his father-in-law, Michael Cresap, of murder. In response, Jefferson called for depositions from those who participated or witnessed the proceedings. He then published an amended account in 1800, correcting the mistakes from his original work but failing to rectify all of his inaccuracies. Today, it is generally accepted that Cresap did not participate directly in the killing and scalping of nine natives, including either Logan's pregnant sister or pregnant sister-in-law, in what became known as the Yellow Creek Massacre. The party that did, which included several members of Cresap's group, was led by Daniel Greathouse. Cresap, however, did participate in two other attacks on peaceful Shawnee in the same region, allegedly killing some of Logan's other relatives. Thanks in part to Jefferson's interest, Logan's speech was widely reproduced in American newspapers, almanacs, and books during the early 1800s. 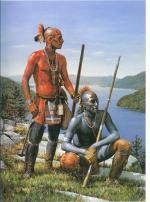 American authors used it as a model for how their Indian characters were supposed to speak. Its influence on the American literary imagination can be seen in James Fenimore Cooper's Last of the Mohicans and many similar works that presented the "vanishing Indian" as a fierce but noble warrior witnessing the end of his way of life. This depiction of the Indian in American culture is still prevalent today, especially in popular films such as Last of the Mohicans and Dances with Wolves. Anthony F. C Wallace, Jefferson and the Indians: The Tragic Fate of the First Americans (Cambridge, MA: Belknap Press of Harvard University Press), 1999.